Excitement reigned Tuesday night on Santa Barbara’s State Street. On one block, several generations of colorfully garbed concertgoers milled about, ready for a sold out show by the Patti Smith Band at the Granada Theater, while half a block away, another glitzy crowd grew to 1000 outside the Arlington Theater. There, the Santa Barbara International Film Festival - its red carpets rolled out, its searchlights fired up - was kicking off its 30th year. SBIFF’s Opening Night saw the U.S. premiere of “Desert Dancer,” based on the true story of a young, self-taught dancer in Iran, a country where dancing has been banned since 1979. Set against the 2009 presidential protests, Afshin Ghaffarian (Reece Ritchie) and a group of dancers (including Nazanin Boniadi and Freida Pinto) risk their lives to form an underground dance company and pursue this art form they love. 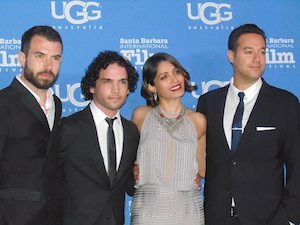 Festivalgoers glimpsed stars Ritchie, Boniadi and Pinto, as well as cast member Tom Cullen (currently seen in PBS’s Masterpiece Theatre’s “Downton Abbey”), along with the film’s director, Richard Raymond. Also attending the screening were British director Peter Chelsom (“Hector and the Search for Happiness”) and RogerEbert.com publisher Chaz Ebert, both of whom are serving this year as festival jurors. The after-party drew a happy crowd who’d clearly enjoyed the film. I spoke with one young woman who talked of how, watching it, she thought about the very recent attacks in Paris and the creative freedom she believes we Americans take too much for granted. Another said she liked it very much while her companion admitted she’d just seen Patti Smith but hoped she’d get a chance to see the film soon. SBIFF runs 11 days this year with more than 200 films from 54 countries to be screened. Each year features many Academy Award nominees with this time no exception. Twenty-four nominees will attend, including Michael Keaton, receiving SBIFF’s Modern Master Award; Ethan Hawke and Patricia Arquette (the American Riviera Award); Eddie Redmayne and Felicity Jones (the Cinema Vanguard Award), and others. Excellent annual panels present A-list producers, screenwriters and directors, with the latter being moved this year to a much larger venue - the 2000-seat Arlington Theater - due to the popularity of the event. Directors Damien Chazelle (“Whiplash”), Richard Linklater (“Boyhood”), Bennett Miller (“Foxcatcher”), Laura Poitras (“Citizenfour”), and Morten Tyldum (“The Imitation Game”) will certainly enliven this year’s always great presentation. A highlight this time is a special event honoring Santa Barbara’s Cousteau Family. “Jean-Michel Cousteau’s Secret Ocean 3D” will have its world premiere with Jean-Michel, the son of the late Jacques Cousteau, and his children, Fabien and Celine, attending and receiving the festival’s Attenborough Award. 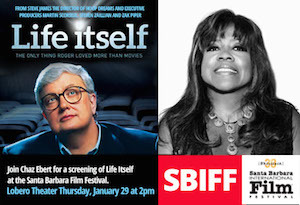 And a personal favorite: Steve James’ superb Roger Ebert documentary, “Life Itself,” will be shown twice at SBIFF. There will be a public screening on January 29th, and a private screening for students on January 31st, with Chaz Ebert in attendance each time. Chaz reports she’s long wanted to attend the Santa Barbara Film Festival, and it’s wonderful to have her here this year.